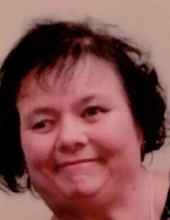 Linda Gordon, 57, of Hardinsburg, KY, passed away Tuesday, April 2, 2019 at her residence. Linda was born January 19, 1962 to the late Gary Jones and Betty Jean Jones of Louisville. Linda loved arts and crafts, playing bingo and spending time with her kids and grandkids. Leaving behind to mourn her passing are her sons; Chris (Stephanie) Gordon and Daniel (Becky) Gordon, daughter, Patricia (Jonathan) Tuttle; and 8 grandchildren. The family will receive friends from 10:00 until 1:00 on Saturday, April 6th at the Cloverport Funeral home. A memorial service honoring her life follow at 1:00. You may share your thoughts and memories of Linda with the family on our website; www.cloverportfh.com. To plant a tree in memory of Linda Darnelle Gordon, please visit our Tribute Store. "Email Address" would like to share the life celebration of Linda Darnelle Gordon. Click on the "link" to go to share a favorite memory or leave a condolence message for the family.